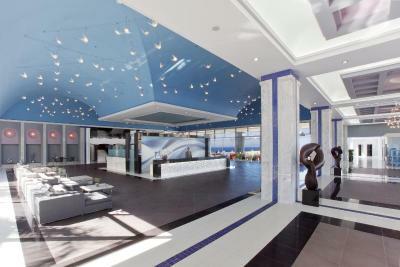 Lock in a great price for Atrium Platinum Resort & Spa – rated 9.5 by recent guests! Very clean (!) and the staff is very polite and welcoming. Great view to the sea. Great hotel. The staff is very polite and caring. 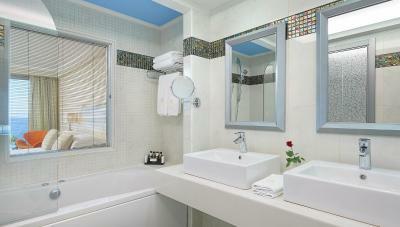 Room is modern and very spacious with a big bathroom. The only little minus was the beach across the road. Too many stones and windy. But we hired a car and visited fantastic beaches. Very close to Rodos old town with lots of shops and restaurants. Overall we are very happy to choose this hotel. Great overall experience, the staff went out of their way to make you happy. Staff were over the top on service. So impressed! They were friendly, efficient, thoughtful, and extremely helpful. I never write reviews but was so impressed with service. Breakfast was incredible and over the top as well. Would highly recommend this hotel. Very poor decoration looks like a hospital, very cold atmosphere. Eggs cold & no fresh juice at breakfast. Beach far away. We moved after 2 nights to Aquagrand in Lindos even though we paid Booking for 3. Aquagrand was much better for the Shai ame price. We think Booking should refund us for one night. The personal is awesome. So kind and useful. The facilities are pleasurable and the staying was excellent. highly recommended; great staff, friendly people, yummy food! Lovely hotel but location not the best. Poor beach, I thnk the hotel shoukd maybe clean up beach and have sunbeds etc for hire there. Pool temperature far too cold! Massive pool area but hardly anyone using it because it was too cold! Indoor pool should be free to guests of hotel. Buffet great but food never very warm. 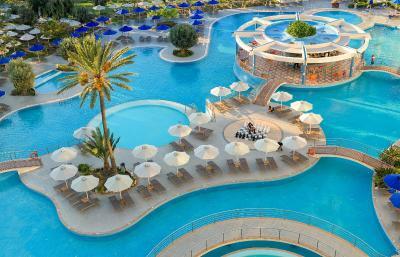 Excellent resort in Rhodes. Very clean, spacious room with king size super comfy bed. Breakfast had big variety and the staff is so helpful and gentle. Nice pool area and many restaurant choices. Speedy wifi. We would return! We enjoyed it! 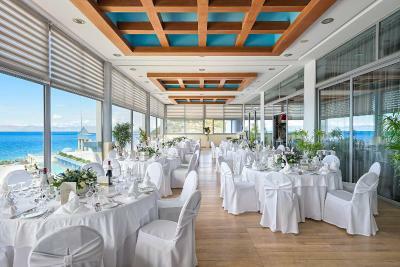 Atrium Platinum Resort & Spa This rating is a reflection of how the property compares to the industry standard when it comes to price, facilities and services available. It's based on a self-evaluation by the property. Use this rating to help choose your stay! 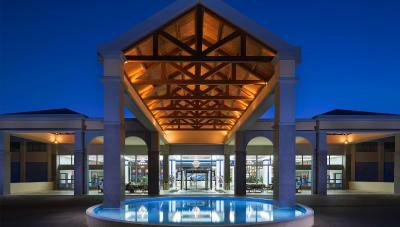 This 5-star spa resort sits within proximity of a public beach featuring water sports facilities. 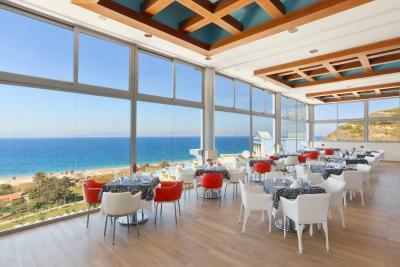 Its rooms offer stunning sunset views, while all public hotel areas and rooms have unobstructed sea views. 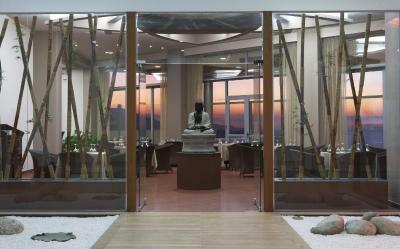 The Aphrodite & Hermes Spa Center features body and face treatment rooms and a heated indoor pool. 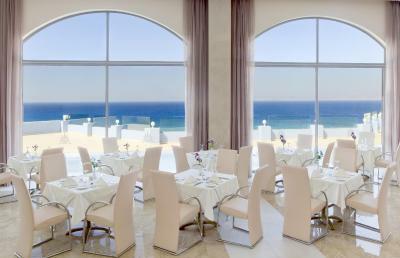 The Atrium Platinum Resort’s 2 thematic pool-side restaurants offer a splendid view of the sea, the open pool and the beautiful gardens. 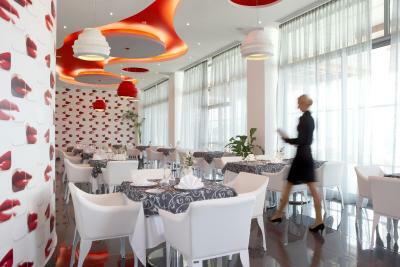 Other dining options include 2 a la carte and one main restaurant. Drinks and cocktails are served at the main bar. 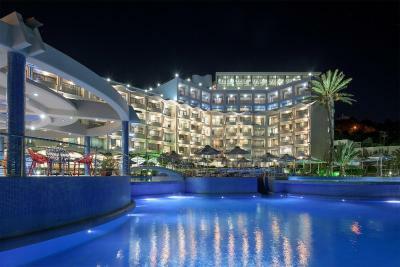 Leisure facilities of the Atrium Platinum include an external pool with bar and a gym area with squash and tennis courts. 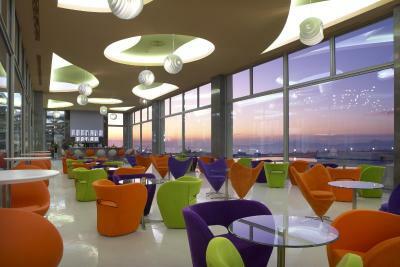 Free WiFi access is provided throughout and free parking is possible on site. 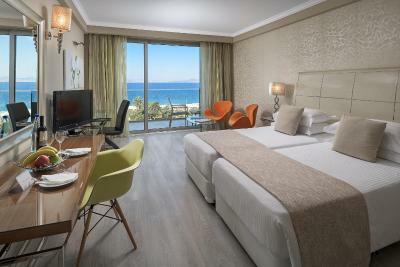 The brand new Atrium Platinum is on the west coast of Rhodes, 1,650 feet from the beach of Ixia and 2.5 mi from the Medieval Town of Rhodes. 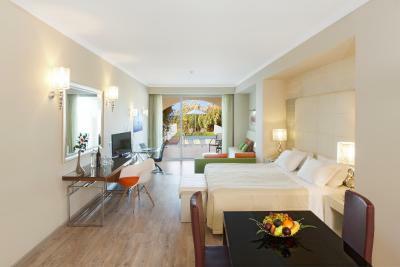 When would you like to stay at Atrium Platinum Resort & Spa? 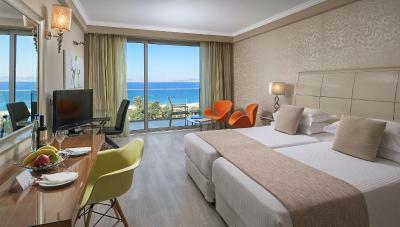 A generously sized double room with spa bath and sea view from your balcony. Free WiFi access is provided. Please note that the rate is based on 2 or 3 guests. Maximum occupancy is 3 guests (see Hotel Policies). Open plan suite with seating area, a 16-m2 private pool and stunning sea view. Free WiFi access is provided. 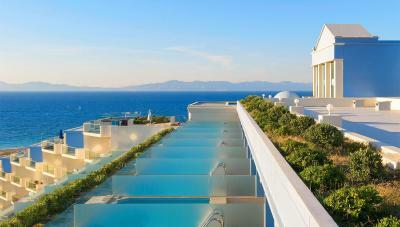 This graciously sized double room features a private swimming pool and sea view from a sundeck on a high floor with a spa bath. Free WiFi access is provided. Please note that the rate is based on 2 or 3 guests. Please note that maximum occupancy is 3 (see hotel policies). 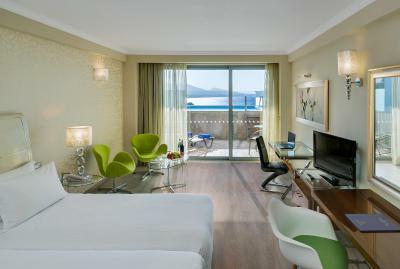 Superior Suite on a high floor with unobstructed sea view, 2 balconies and free WiFi access. A separate living room is provided. Featuring an elevated private pool, this suite has a master bedroom and a separate seating/sleeping area. The bathroom has a spa bath and there is also a furnished balcony with sea view. Please note that the rate is based on 2 or 3 guests. Maximum occupancy is 4 guests (see hotel policies). Spacious double room opening to a balcony with side sea view. The bathroom has a spa bath. Free WiFi access is provided. 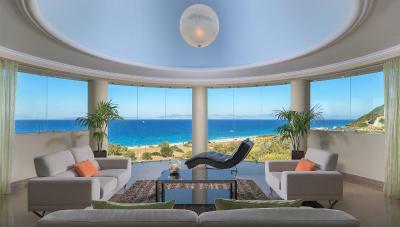 Open-plan suite with seating area, a 16-m2 private pool and stunning sea view. Free WiFi access is provided. Please note that the rate is based on 2 adults and 1 child (up to 12 years old). Maximum occupancy is 3 guests (see Hotel Policies). 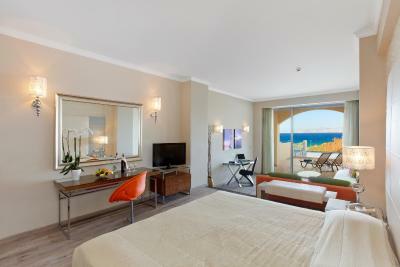 Located on an upper floor, this superior suite offers unobstructed sea views, 2 balconies and free WiFi access. A separate living room is provided. This double room has a balcony, bathrobe and spa bath. 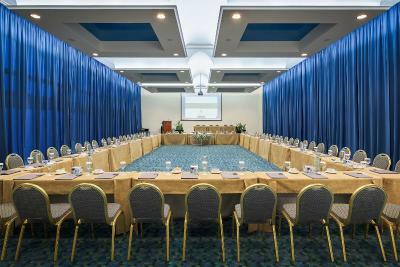 House Rules Atrium Platinum Resort & Spa takes special requests – add in the next step! 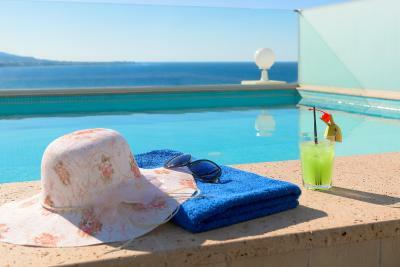 Atrium Platinum Resort &amp; Spa accepts these cards and reserves the right to temporarily hold an amount prior to arrival. 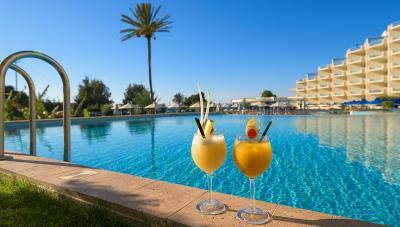 Atrium Platinum Resort & Spa accepts these cards and reserves the right to temporarily hold an amount prior to arrival. 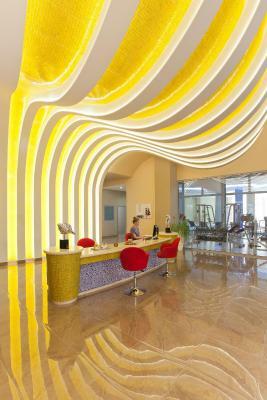 Please note that entrance to Aphrodite & Hermes Spa Center is only allowed to people above 14 years of age. Please note that the access to the indoor pool and spa facilities is upon charge. Guests are offered a welcome basket of fresh fruit and local wine or water upon arrival. Please note that the half-board option is served only in the main restaurant (beverages excluded). Also, gentlemen need to wear long trousers according to the resort's dressing code policy. Please note that the remaining amount after the required deposit is to be paid upon check-in. Food could have been warmer. The food was a bit too salty. More suitable for families. 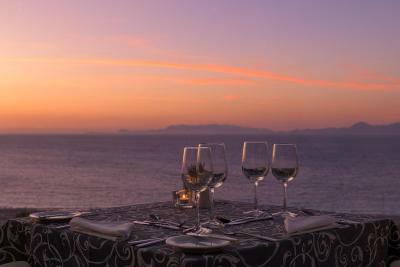 My wife and I were on our honeymoon - we noticed that we had preferred the smaller boutique type hotels and felt a more welcoming presence from the staff. Staff were very friendly and accommodating. Being a massive resort, it had plenty of space around the pool & other great facilities. Good combination between mountain and sea. Very unhelpful and rude and unfriendly staff . All the staff need a training to learn how to treat people. Very bad experience because of the bad staff. I loved everything about this resort. Luxury at its finest. Amazingly spacious room with room to spare. All rooms appear to face the enourmous pool area and local beach. There's no need to go anywhere as it has its own mini market, hairdresser's, two clothing shops, four restaurants, a gym, sauna and, of course, spa. You can book your tours from there, rent a car and there's a 24 hour ATM. The staff go out of there way to help you and are very professional and friendly. About a 7 minute drive to Rhodes Old Town and 5 minute drive to the new town. Plenty to do. Can't say enough. 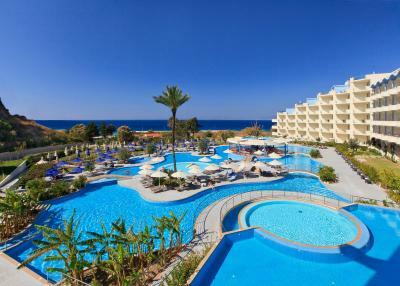 Will definitely be booking again should I ever come back to Rhodes. It was perfect. I am sorry that we only had 4 days and the highest score is only 10, because the hotel and the whole experience was at least 12. Great hotel would highly recommend it to anyone. The swimming pool area a little bit worn out; the location could be better; some balcony views face part of mountain/garden, only partially sea. Empty corridors, could have more objects, paintings, flowers etc .. you feel like in apartment block. Good food in a restaurant, large room, SPA bath, huge bathroom, comfort; coffee, wine in the room. Spacious hotel, sunset view, large balcony, comfortable bed. Easy access from parking. Friendly staff. 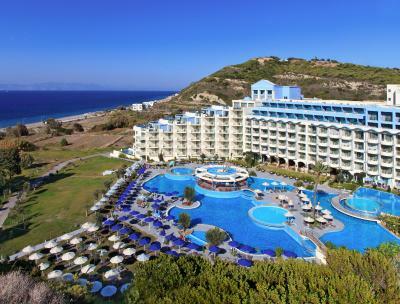 Very nice resort to stay in Rhodes. Restuarants and food was extremely good. Rooms are spacious and clean. Staff are very nice. Will stay again.